Experimental Drug Is First To Help Kids With Premature-Aging Disease : Shots - Health News The new drug reversed changes in blood vessels that usually lead kids with the rare genetic disease progeria to have heart attacks and strokes. Research on the toxic protein responsible for progeria is also changing scientists' understanding of how normal cells age. 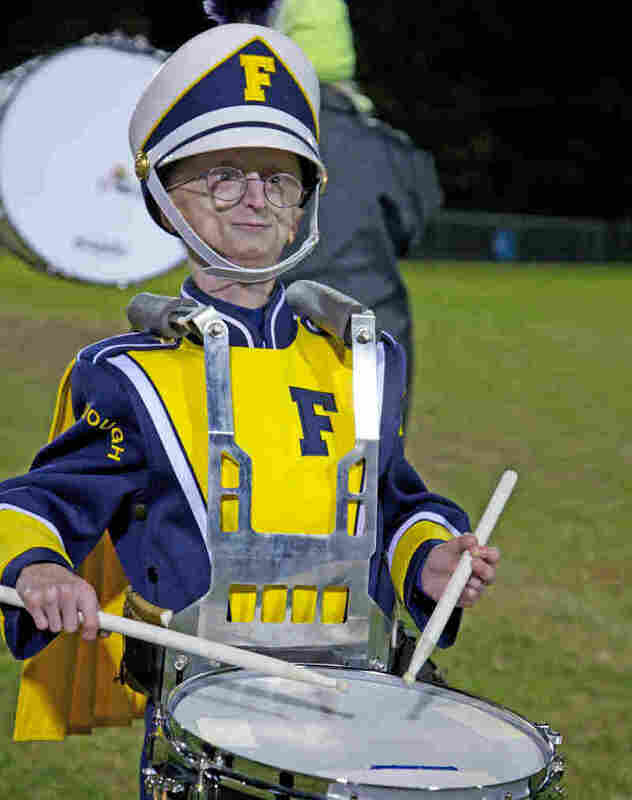 Sam Berns, 15, who has the very rare premature-aging disease progeria, plays the drums in his high school's marching band. Researchers have found the first drug to treat progeria, an extremely rare genetic disease that causes children to age so rapidly that many die in their teens. The drug, called lonafarnib, is not a cure. But in a study published Monday of 28 children, it reversed changes in blood vessels that usually lead to heart attacks and strokes. The treatment also helped kids with the disease put on weight and improved the structure of their bones. Children with progeria have small fragile bodies and can weigh just a third of a typical child their age. "This is a fantastic first step," says Leslie Gordon, medical director for the Progeria Research Foundation and the mother of a child with progeria. A second study is under way to see whether combining lonafarnib with two other drugs will work even better, says Gordon, who is also a physician on the faculty of Boston Children's Hospital and Brown University. The research that led to the drug also has led to a better understanding of how aging takes place in individual cells, Gordon says. But perhaps the most remarkable thing about the new treatment is how fast it was developed. Just a decade ago, researchers didn't even know what caused progeria, let alone how to treat it. The quick pace of research is in large part the result of Leslie Gordon and her husband, Scott Berns, who is also a physician. Their son, Sam, was diagnosed with progeria in 1998, shortly before he turned 2. At the time, they knew very little about progeria, which affects perhaps 100 people worldwide. And what the experts told them was discouraging, Gordon says. "All children, we were told, die of heart attacks or strokes between the ages of maybe 7 and 20 years," she says. "Nobody knew the cause. No one was working on this and we were nowhere. There was no place for us to go to understand what was happening with our child." So Gordon and her husband set out to find the cause of this rare disease, and a cure. They started a foundation. Gordon began doing research on progeria. But things might have gone slowly without some help from a scientist named Francis Collins. Collins is not just any scientist. These days he runs the National Institutes of Health. Back then he was in charge of the government's effort to map the human genome. And early in his career, Collins actually cared for a patient with progeria. "It was a fascinating circumstance but a very frustrating one because there was nothing much known about the disease," he says. "So I didn't quite know what to offer this wonderful young woman." The woman died in her 20s. But Collins never forgot her. "And then I met Leslie and her husband, Scott, and learned that they had a son with this condition," he says. So Collins joined a consortium of genetic scientists set up by Gordon's foundation. He also asked a researcher in his lab to look for a genetic cause of the disease. He gave her a year. "And in substantially less than a year we had the answer," Collins says, thanks to "a combination of a very good post-doc, a pretty good strategy, and a little good luck along the way." The cause was a single, chance mutation on a single gene. Just one misplaced letter out of billions in the genetic code was leading to the production of a toxic protein that makes cells age prematurely. Finding the cause of a genetic disease does not necessarily lead to a treatment. But in this case, Collins says, scientists had spent decades studying the gene where the error occurred. All that happened about five years after Sam was diagnosed. And by this time, Sam was in grade school and living a pretty normal life, Gordon says. "Sam was acting like his age. And he had friends his own age," she says. "He was just much, much smaller than the rest of his friends and, yes, he had no hair. But that doesn't matter to your friends. And so he was going to school and growing up and doing, actually fantastic." Even so, Gordon knew she was in a race against time. At this point, researchers thought they knew what sort of drug might protect cells from the toxic protein that causes progeria. Developing a drug like that from scratch could have taken many years. But by chance, pharmaceutical companies already had some drugs in production that looked like good candidates. These were experimental cancer drugs that just happened to affect the same process involved in progeria. "Again, we got lucky because there was 10 years' worth of pharmaceutical research into developing a drug that we asked to be moved over into the field of progeria," Gordon says. But the progeria team needed help from someone who understood these unusual cancer drugs. Enter Mark Kieran, a pediatric brain cancer specialist at Boston Children's Hospital and the Dana Farber Cancer Institute. "There were only a couple of people in the world that had been testing these drugs and one of them was me," Kieran says." By the time Kieran got involved around 2006, researchers had already shown that a drug called lonafarnib could help mice with the progeria gene. "They now had all of the science," Kieran says. "What they had never done before was actually figure out how to move it into the clinic to treat kids. And since that's what I do everyday, that's where we were able to kind of put our expertise together to make this thing happen." It happened fast. The study began in 2007 and was designed to run for several years. It included 28 children from 16 countries, including Sam. The results appear in the Proceedings of the National Academy of Sciences, and they are encouraging. Overall, lonafarnib helped children gain weight and improve their bone structure. But more important, Gordon says, it has reversed changes in blood vessels associated with the heart attacks and strokes that usually kill kids with progeria. "That was an absolutely home run pivotal finding for our study," she says. This drug isn't a cure. But it's an important first step, Gordon says. And she notes that researchers have already moved on to a second study using lonafarnib and two other drugs. The race against progeria has been run to benefit just a few dozen children around the globe. But there's been an unexpected payoff for the rest of humanity. Research on the toxic protein responsible for progeria is changing scientists' understanding of how normal cells age. "It has told us something pretty profound, namely that all of us are making little bits of this same toxic protein," Collins says. "Kids with progeria are making a lot. We're making a little bit. And as our cells get older and older they start making more." So as some researchers focus on progeria itself, others will be looking for ways to use this new information to ward off a range of diseases associated with aging. As for Sam, he's almost 16 now, working to become an Eagle Scout, and likes to play percussion in his school band. "For marching band I play the giant timpani drums," Sam says. "So that's a lot of fun. And I do a little bit of snare and bongos." Progeria often means finding a different way to do what other kids are doing, Sam says. But the disease rarely stops him. "We designed a new snare drum that's a lot lighter and more comfortable for me," he says. "So we always keep my health in mind. But 99.9 percent of the time I get to do exactly what I want." Sam says the most important thing people should know about him is that he has a great family and a very happy life.